Deadline for sending an Abstract is March 10th, 2019. Deadline for sending an Abstract is March 1st, 2019. 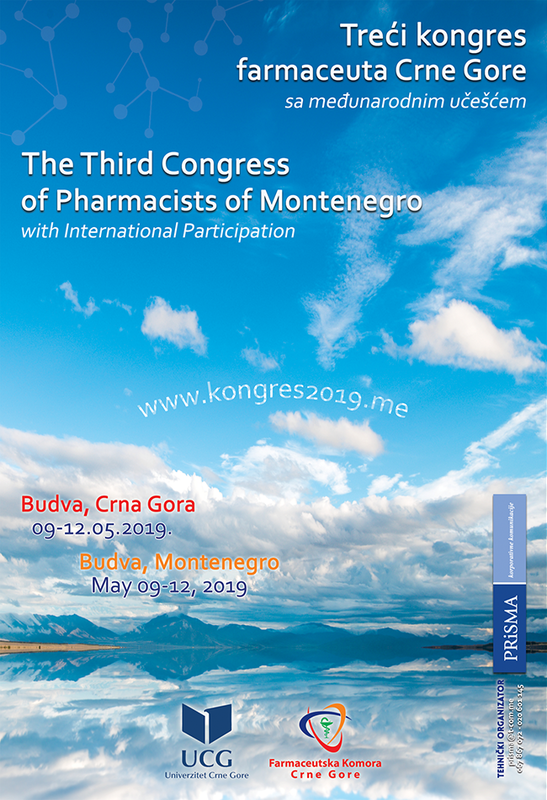 We are pleased to invite you to the 3rd Congress of Pharmacists of Montenegro with international participation, which will be held from 9-12 May 2019 in the congress center “Montenegro Stars” in Bečići, Budva. The congress is organized by the Faculty of Medicine University of Montenegro – Study Program Pharmacy, and Pharmaceutical Chamber of Montenegro. With your participation you will contribute to our aspiration for the development of pharmaceutical activities in Montenegro, as well as professional implementation and encouraging professional and scientific cooperation in the region and beyond. We invite you to take an active part, submit your work and share the scientific and professional experiences from the practice. In addition to the scientific program, we will try to be a good host and show you a part of the beauty of our coast, so hopefully this Congress will remain in your most memorable memory. It is now becoming a tradition to try to repeat the success of the previous two Congresses, together with you. Therefore, this way we announce you the 3rd Congress of Pharmacists of Montenegro with international participation, organized by the Pharmaceutical Chamber of Montenegro and Faculty of Medicine – Study program Pharmacy in Podgorica, in cooperation with the Agency for Drugs and Medical Devices of Montenegro. The Congress will be held in the congress centre ‘Montenegro Stars’ hotel group in Bečići, in the period from 9 to 12 May 2019, with the presence of numerous foreign and local renowned lecturers. We are faced with a challenge to meet the chances and solve the problem in pharmaceutical profession, just as the name of our Congress says: “New Horizons in Pharmacy – Challenges and Possibilities“. We are looking forward to working and spending time together! The President of the Organizing Committee, Milica Popivoda, dipl.ph.